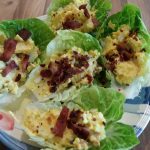 This is a delicious take on egg mayo (without the mayo), I used cream cheese and it is delicious, with crispy bacon just to finish it off. Great as breakfast, brunch or lunch. Place a saucepan of water on to a medium heat and bring to the boil. Add the eggs and cook for 6 minutes until eggs are cooked, I like hard boiled for this recipe. Add the bacon to a medium frying pan and cook until crispy. Remove to a cutting board and copy into small pieces. Add the cream cheese to the eggs and mix well. Add half of the bacon to the egg mixture and mix again. Load the egg mixture into the lettuce leaves. 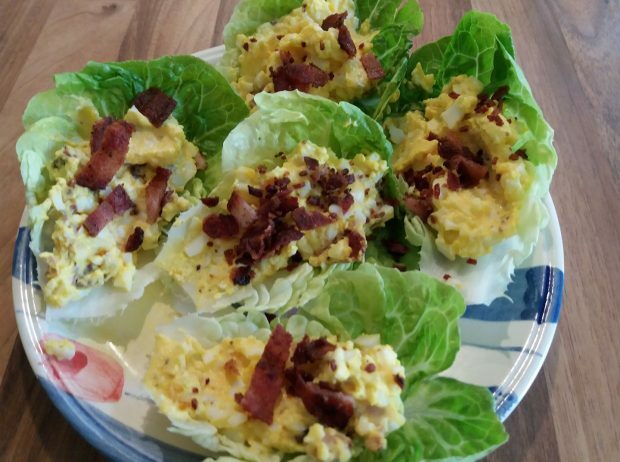 Sprinkle the remained of the crispy bacon between the lettuce cups.